During the last 35 years that I have been practicing as a Naturopath I have noticed that people are becoming more acidic. Having spoken to other practitioners who were treating people 30 years ago, they agree with me. I personally remember having to treat people who were too alkaline, however it has been many years since I have needed to do this. I am not necessarily talking about a severe over acid condition like acidosis which is a more serious condition. Even if the body is a little acidic it can cause various health problems. The main reason being over acidic is harmful is because over acidity creates inflammation, and inflammation can cause damage to the body that can create illness. Inflammation is involved in every illness from common infections to more serious conditions. Virus and bacteria love an over acid condition and also contribute to acidity! The first is chronic stress. Over the past 30 years the pace of life has increased dramatically. Our bodies were not meant to deal with this type of stress, and when under stress the body produces acids as a natural response. In particular, the adrenal glands secrete the stress hormones, cortisol and adrenaline. These hormonal secretions lead to an accelerated metabolic state which creates acids as a by-product. The second is the food we eat. Balance plays an important factor, especially when it comes to our body’s pH levels. pH is a measure of how acidic or alkaline something is, and our blood pH needs to maintain a slightly alkaline level to keep us healthy. We help our bodies to maintain this pH balance by eating more alkaline-forming foods and fewer acid-forming foods. Alkaline-forming foods include most fruits, vegetables, herbs, nuts, seeds and herbal teas. Acid-forming foods include most grains, beans, meats, dairy products, fish, fast foods and processed foods. When we eat acid-forming foods, our body brings our blood pH back into balance by releasing alkaline-rich minerals such as calcium, phosphorus and magnesium into our bloodstream. If we are eating enough alkaline-forming foods each day, then our body has easy access to these minerals from our diet. If we are not eating enough alkaline-forming foods, then our body has to pull these important minerals from our bones, teeth and organs. This can compromise our immune system, cause fatigue and make us vulnerable to virus and disease. A BALANCED DIET - It is advised to eat a diet of 60-80% alkaline-forming foods and 20-40% acid-forming foods. For the acid-forming foods, skip junk food and processed foods. Instead choose healthier options like beans, grains and other fresh foods. Pesticides tend to be acid-forming, so choose organic fruits and vegetables whenever possible. A high-acid diet can create a breeding ground for disease and leads to poor health. If you’re getting achy joints, gaining weight, craving carbs or sugar, or you have brain fog, then you could be too acidic. It’s based on the idea that optimal health comes from balancing the body’s pH by eating more fresh veg and fruit, as well as certain legumes, grains and nuts. Many people start the day with coffee followed by toast and jam, cake for morning tea, then meat and a tiny amount of vegetables for dinner – all of these are acid-forming. A high-acid diet can lead to digestive complaints, bloating, lack of energy, weight problems, ageing and gum disease. Foods to be avoided include acid-forming refined sugar, coffee, dairy and refined carbs (white bread, pasta, alcohol and animal protein). Surprisingly, some foods that have an acid taste – such as lemons and apple cider vinegar actually have an alkalising effect on the body once they’re digested. Switching to an alkaline diet could mean having one coffee instead of three in the morning, eating only one protein meal (typically fish) a day, increasing your vegetable intake, and taking alkaline reacting nutrients. IMPROVED ENERGY LEVELS - Proper cell functioning is very important to a person’s overall energy levels. If the cells are not healthy, they are not as effective at holding and transferring oxygen within the body. This can result in overall fatigue and a lack of energy. The body’s pH level can also affect a cell’s ability to produce adenosine triphosphate (ATP), which is important to the body’s energy levels. This process normally takes place within a cell’s mitochondria. If the body’s pH level is too acidic, this process does not take place as effectively. HEALTHIER TEETH AND GUMS - When the pH level of the body is too acidic, it stands to reason that the mouth will also be quite acidic. Unfortunately, when the level of acid in the mouth is too high, it can cause bacteria to grow at a much faster rate. Bacteria can cause a number of different problems in the mouth, such as gum disease and bad breath. A high level of acid and bacteria in the mouth will also increase a person’s chances for tooth decay. Many people note an improvement in their overall level of oral health after switching to a diet program that promotes an alkaline pH level in the body. PROPER DIGESTION - I think everyone knows that being too acidic is not good for digestion. There are many antacid medications on the market that may ease acid symptoms but do not cure the problem. Indigestion, acid reflux, ulcers, bloating, heartburn, worms, bacteria, burping, bad breath, snoring, flatulence, candida, intestinal cancers, constipation and diarrhoea are all aggravated, if not caused by, being too acidic. IMPROVED IMMUNITY FUNCTION - When cells are healthy, they are effectively able to absorb the nutrients they require. Healthy cells are also efficient at eliminating waste products. If cells become weakened in any way, they are not nearly as effective at these kinds of functions. As a result, infectious organisms have a better chance of affecting these cells. When the body’s pH is too acidic, cells cannot function at their optimal level. This is why a person is more likely to become ill, develop infections, or even develop cancer when their diet is acidic as compared to alkaline. REDUCED PAIN AND INFLAMMATION - Magnesium is one of the minerals the body uses to help control excessive acidity. If you eat a diet that has an acidic effect, the body is forced to use more magnesium to help neutralise it. However, magnesium is also a useful nutrient in the body that helps to support joint and tissue functions. By eating a diet that has an alkaline effect on the body instead of an acidic effect, your body will have more magnesium available to help reduce tissue, joint pain, and inflammation. SLOWER AGEING - When cells are subjected to an acidic environment, they function much less efficiently. This reduction in functionality can impair a cell’s ability to repair itself, thus resulting in premature ageing. Premature ageing can also occur when cells are not able to get enough oxygen, and when they are not able to rid themselves of toxins. An alkaline diet can help prevent all of these scenarios. Better functioning cells means a younger appearance for you. Plus, as an added benefit, an alkaline diet program will also help you maintain a healthy weight. 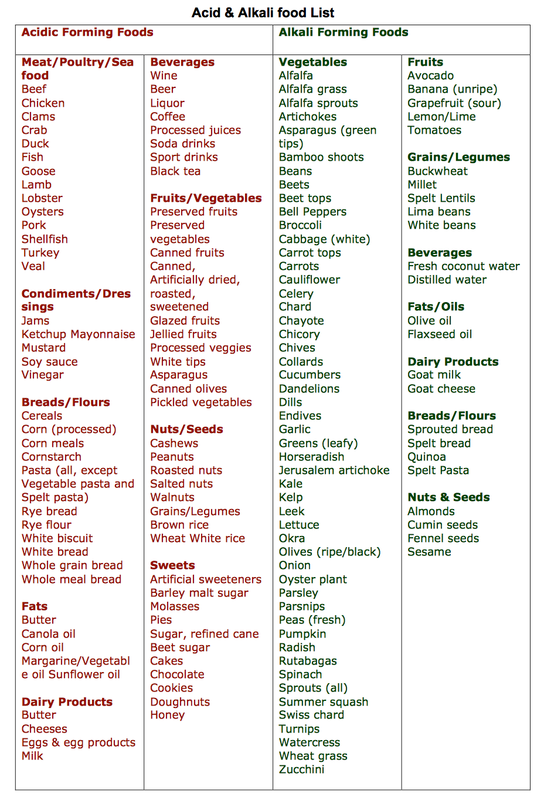 The Alkaline diet is an excellent common sense diet that is backed by research. Therefore, you and your family have a lot to gain by choosing and eating more alkaline reacting foods and avoiding too many acidic reacting foods.